Red Boutilier’s work is, in large part, a document of the modernization of commercial fishing. Modern fishing is accomplished mainly through towing large nets at slow speeds, and the propeller could be its symbol. Here is ARAHO’s patented “Kort” directional steering nozzle, an invention of the 1930s that radically increased propeller efficiency below about 10 knots. These are found today on most tugboats and fishing vessels. ARAHO was built in South Bristol by Gamage Shipbuilders, and at 120 feet was the largest trawler built at a Maine Shipyard since the 1930s. Her construction happened early in a steel shipbuilding boom, the result of imposing a 200 mile offshore limit for foreign vessels, and of the increased availability of Federal loans to improve efficiency. In one photograph, Red captured the coming industrialization of the fishery. 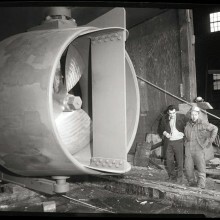 The propeller shown here was the state of the art. The men near it provide scale. One, in coveralls, is clearly part of the yard crew, while the other, suited, looks like an owner or designer. Tobacco pipes in mouths, they could be discussing a design or fabrication challenge, but given that they were close to launching might have been deliberating that. Limited by the size and lens of his Speed Graphic, Red worked hard to find unique angles for his photos. Here he must have climbed onto some staging to be able to shoot down onto the propeller and men. Born to a family of Nova Scotia fishing captains, Red sailed aboard fishing and coasting schooners in the 1930s. After graduating from Dartmouth in 1938, and a stint teaching, then working at Bath Iron Works during World War II, he became a journalist and photographer, with horse racing as a specialty. Moving to Maine sometime around 1960, he became a freelance reporter and recorder of the Maine maritime scene, landing his stories and photos in newspapers, magazines and advertisements. He tried never to miss a launch or a chance to sell his work. He was friends with boat builders from Bath to Camden and often recorded a project from the keel up. His vintage 4 x5 Speed Graphics press camera was his signature tool, with which he produced some 25,000 negatives; these, together with his stories, are among the Museum collections. Especially valuable is his work documenting the change in the fishery from old wooden vessels to modern steel fish catching machines, while at the same time recording the last wooden lobster boat builders and the transition to fiberglass.